40 African heads of state made a fashion statement yesterday; the leaders donned Indian Prime Minister Narendra Modi’s signature look in traditional Indian attire at a dinner held on the sidelines of the 3rd India-Africa Summit in New Delhi. A sleeveless waist coast, the “Modi jacket” is a more colourful variant of the iconic “Nehru jacket” worn by India’s first Prime Minister, Jawaharlal Nehru. 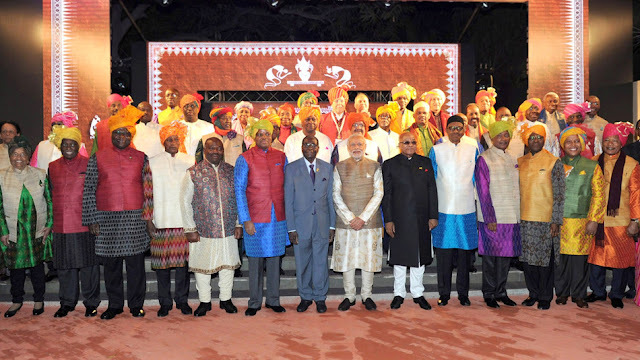 For the India-Africa summit, the Indian government had specially commissioned the Indian fashion label Biba to design bespoke jackets and kurtas in various colours for each leader. Last year, the Indian PM had also gifted a “Modi jacket” to Chinese President Xi Jinping during his visit to India.